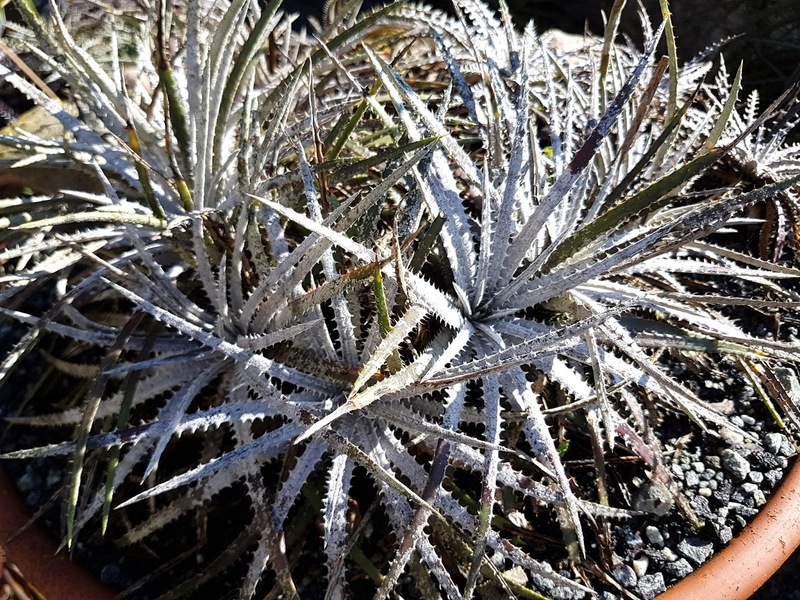 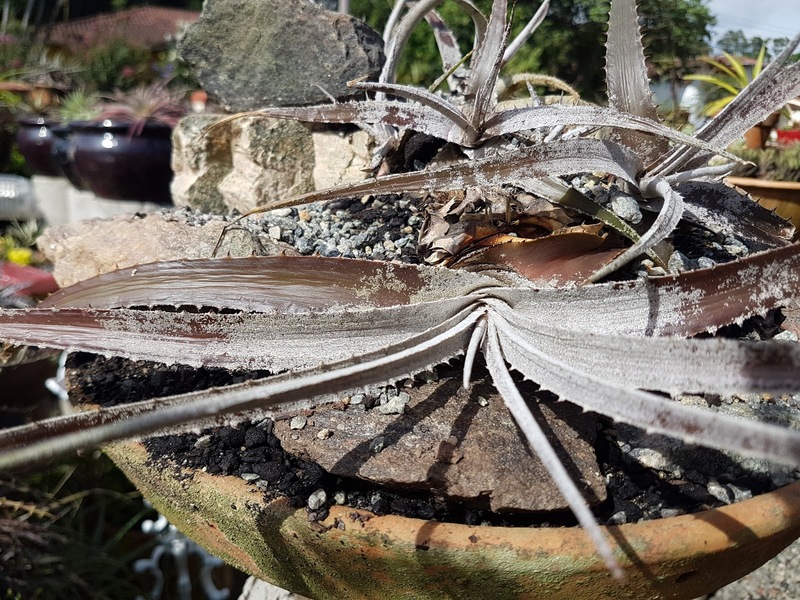 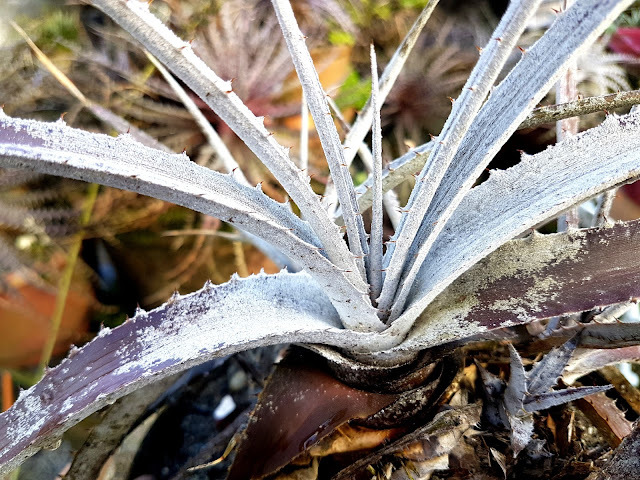 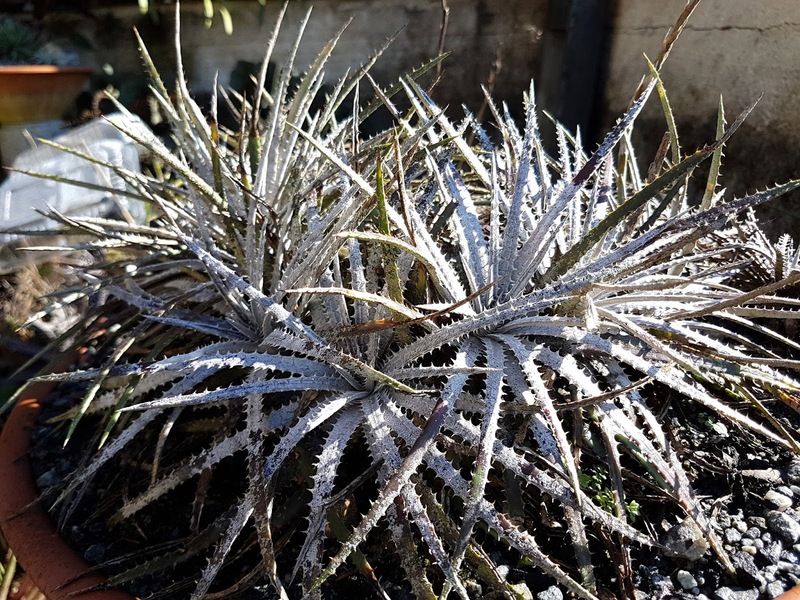 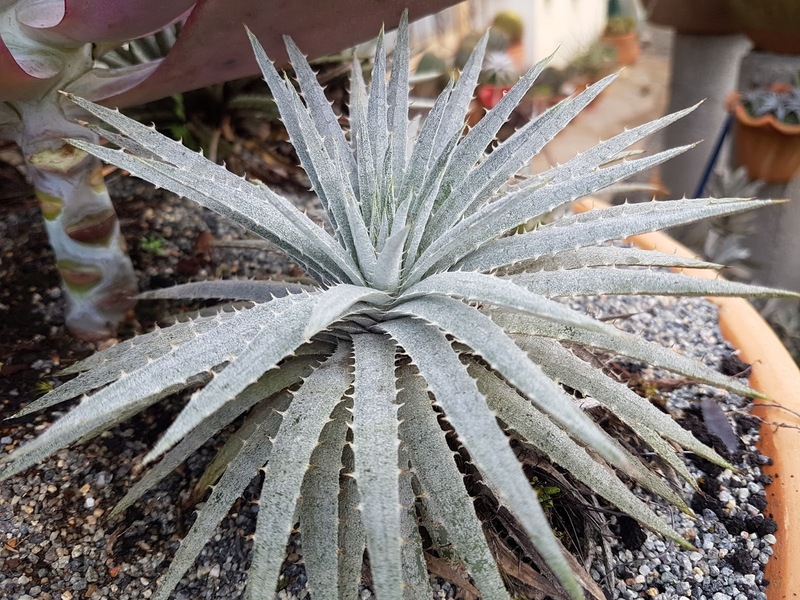 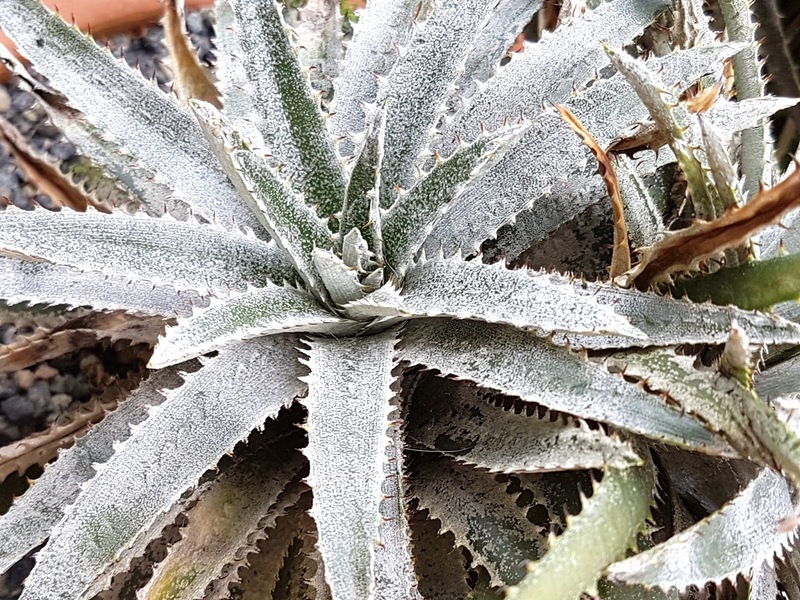 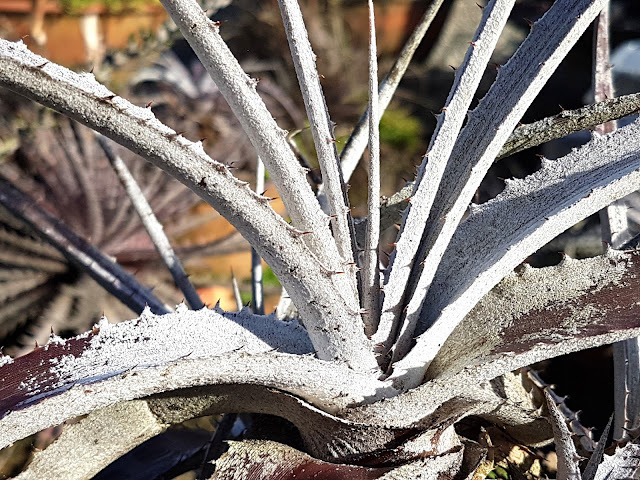 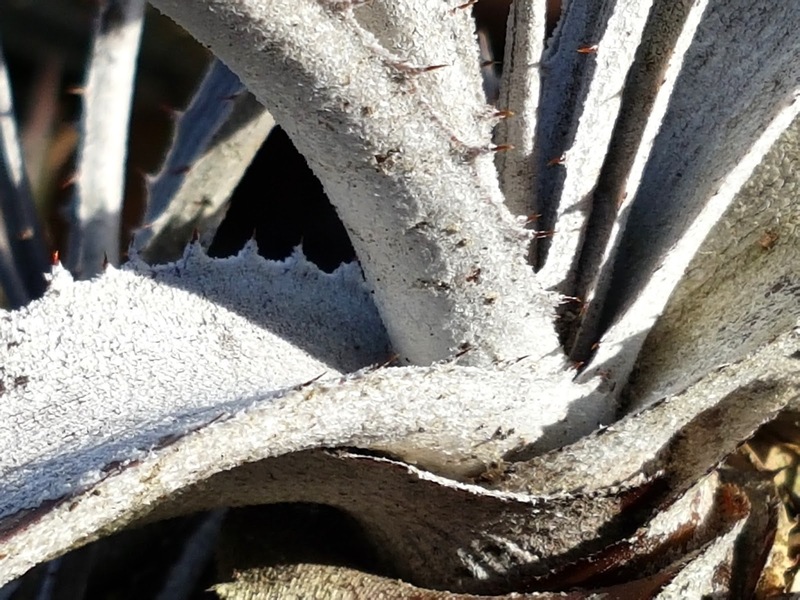 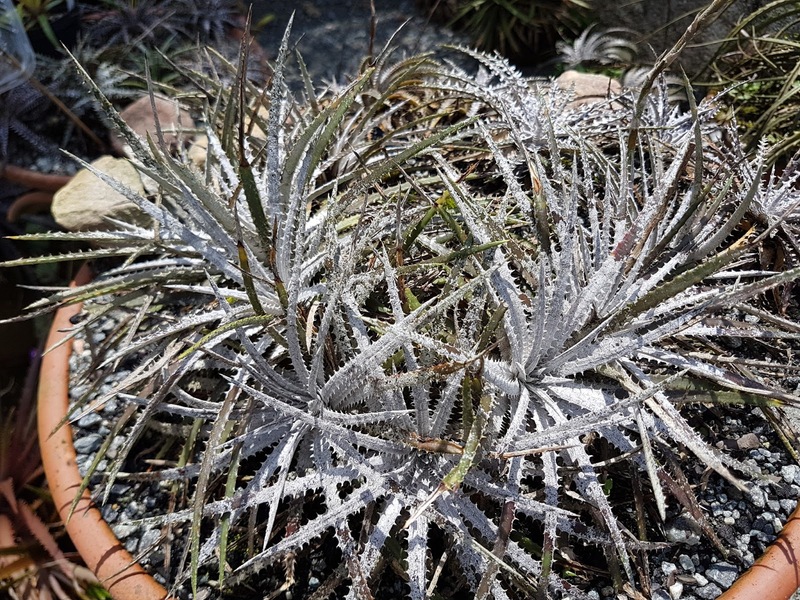 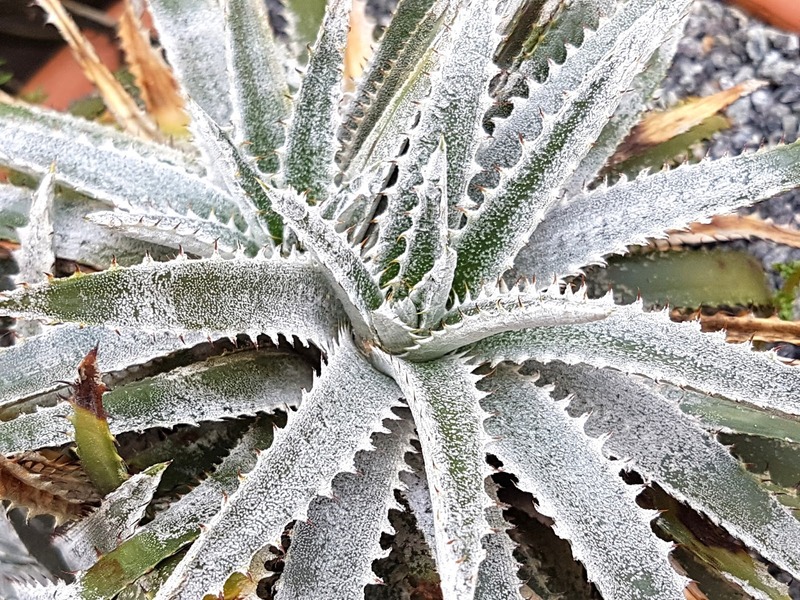 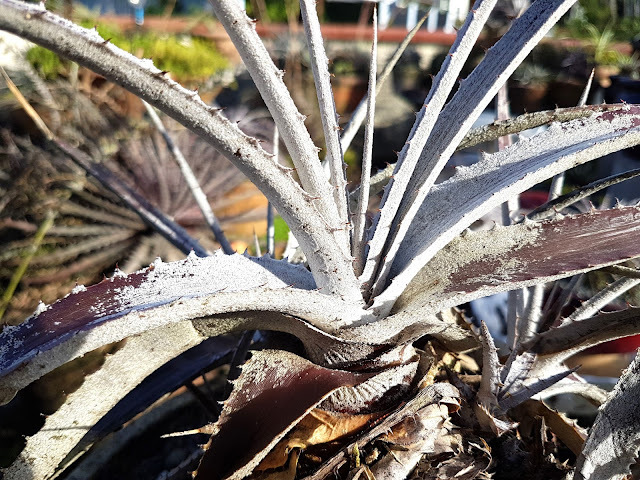 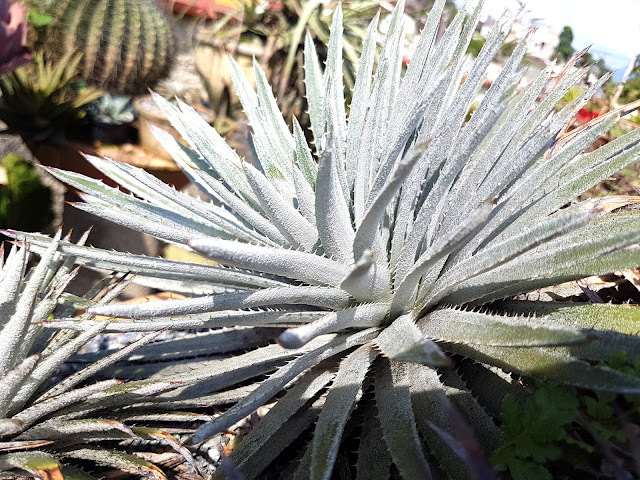 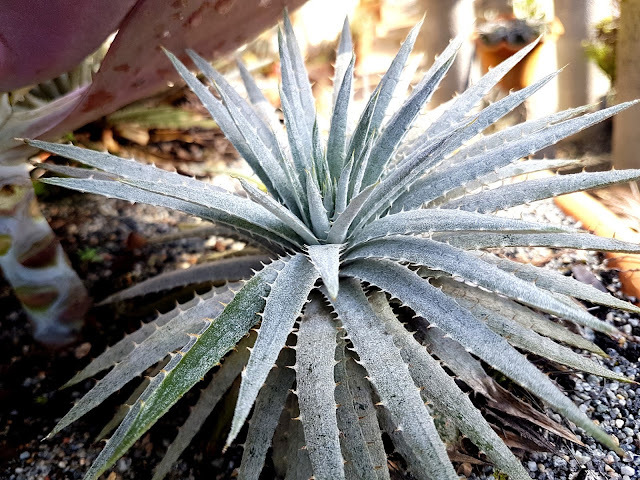 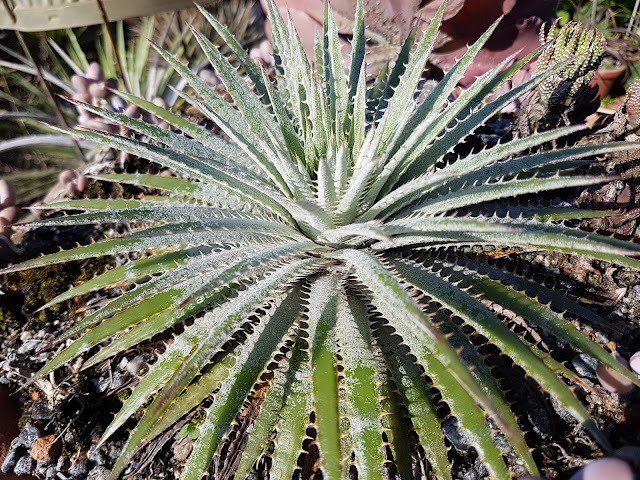 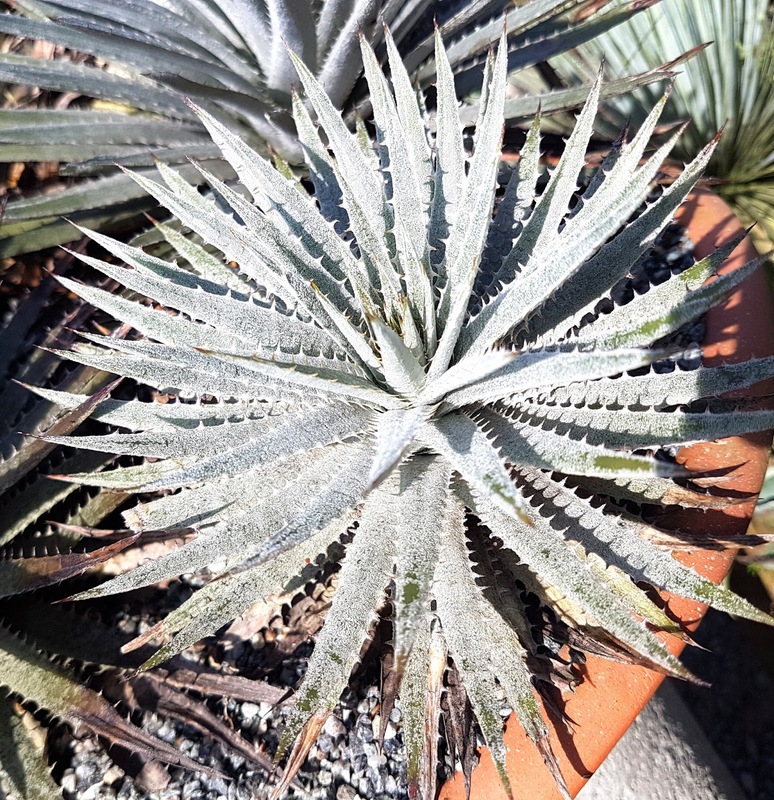 Dyckia fosteriana Sengés has many many forms, this it he whitest I know. 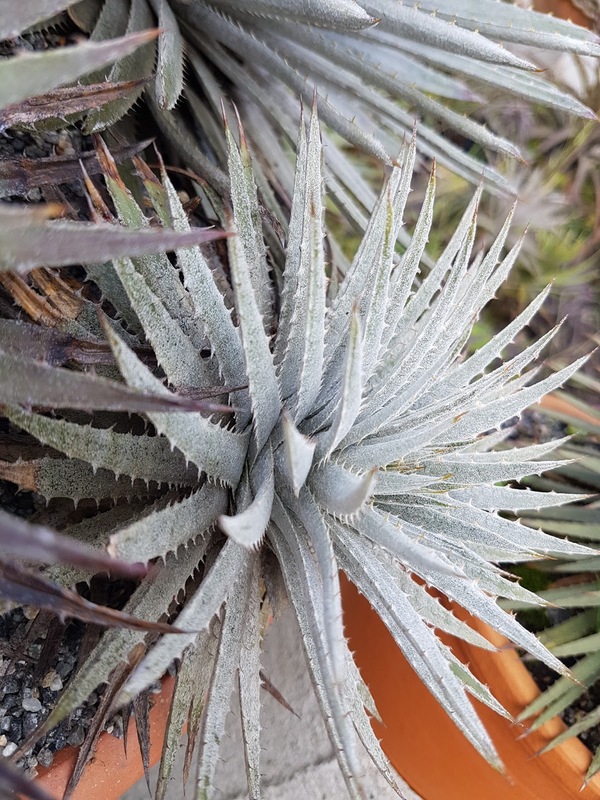 The scale are so dense ans white the rain removes them and leave bald areas on the leaves. This is a plant for the connoisseur. 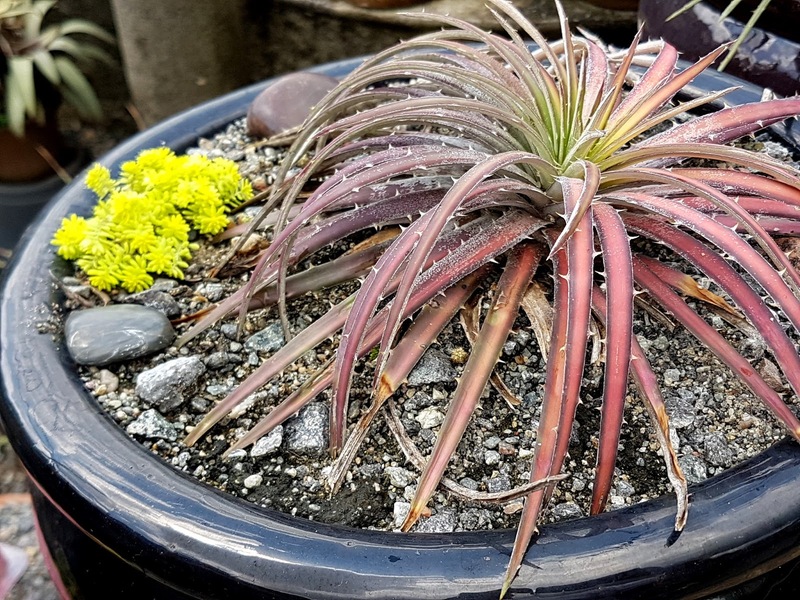 One of the best looking Dyckias! It shows a wonderful shape, nice spines. 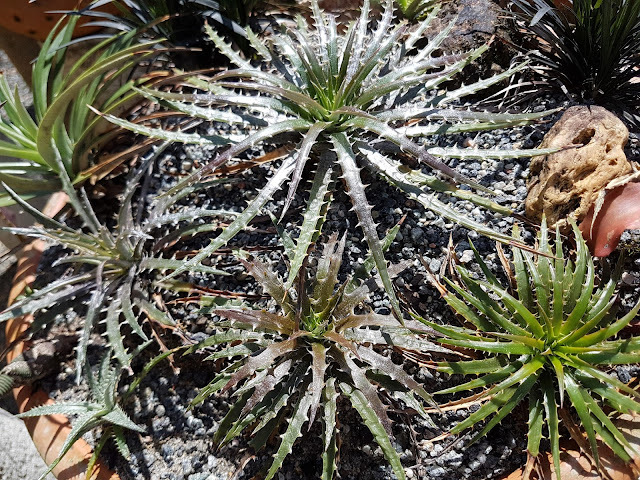 These sp Alpines (mountain dewllers) South Brazilian Dyckias live on top of a hight mountain. 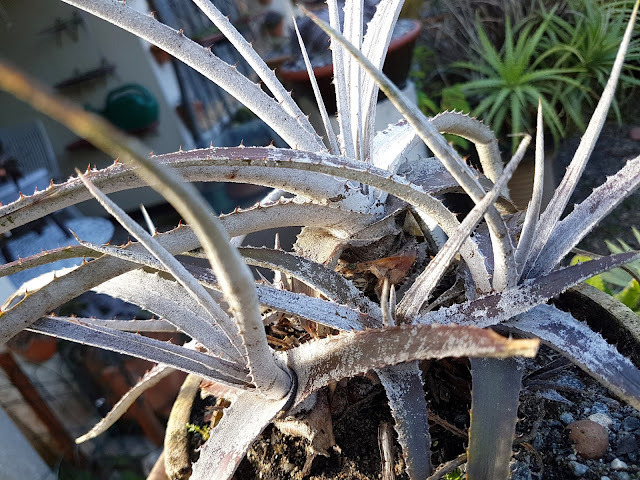 They stand frosts and snow. They have small and flat crowns. 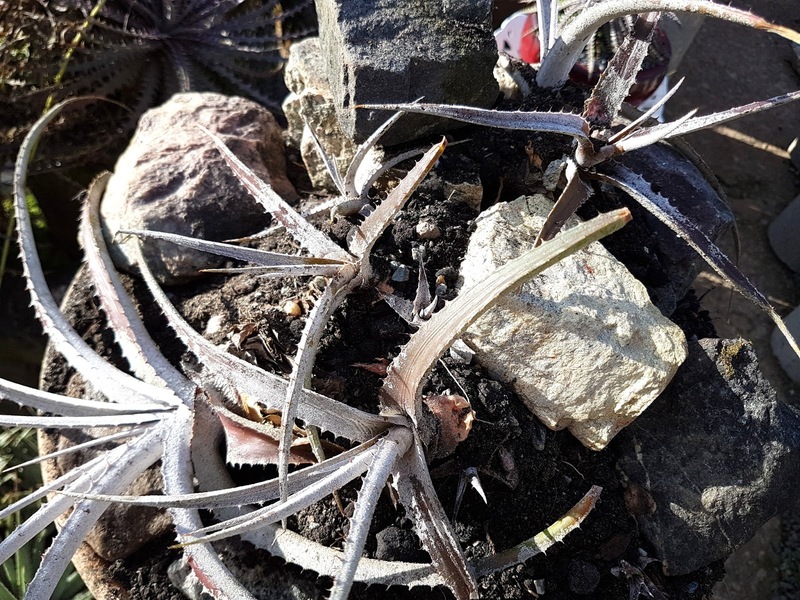 We known almost nothing of them up to now. 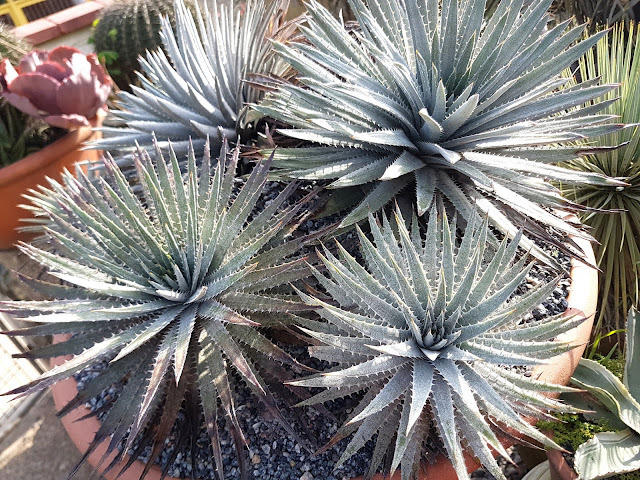 ...but they are besutiful, indeed. 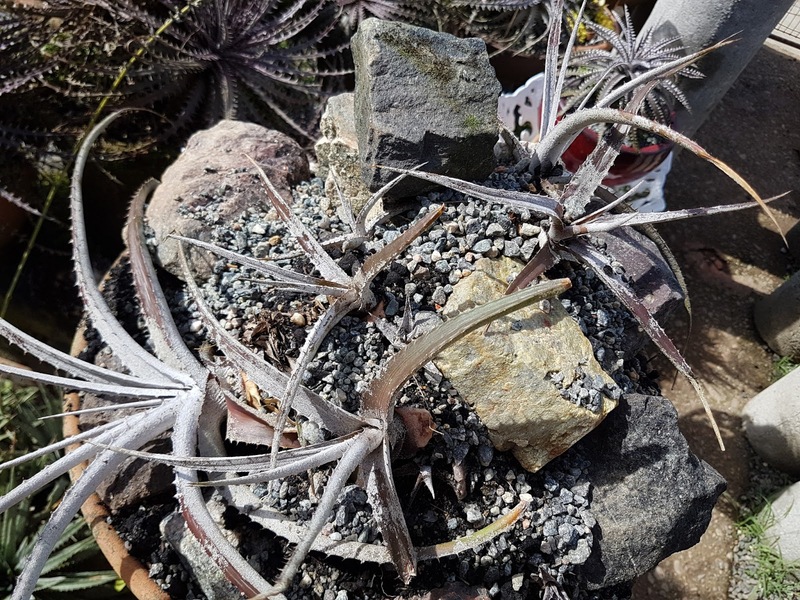 Dyckia hb Picante and its crested blooming stalk. Aurora is a feast for eyes. This pot is a real throne for a beauty. 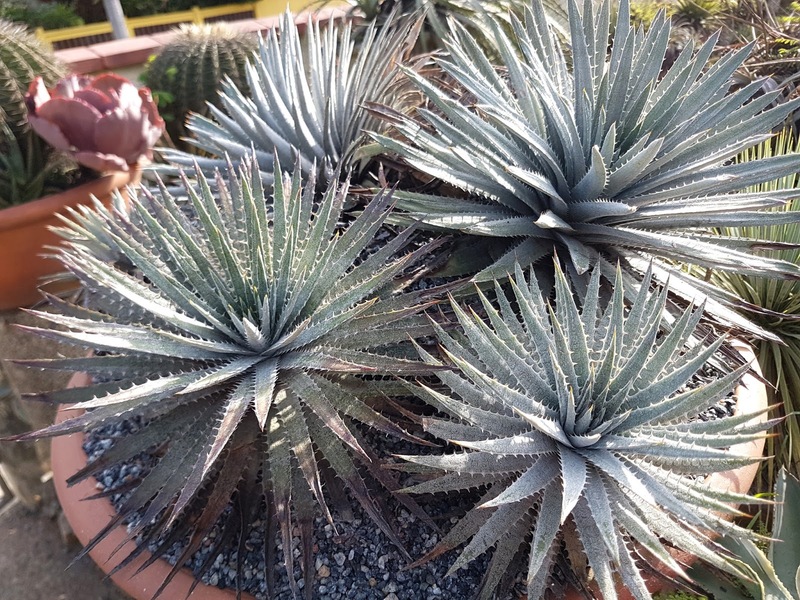 I like and I thing it also does ample roomy ones. 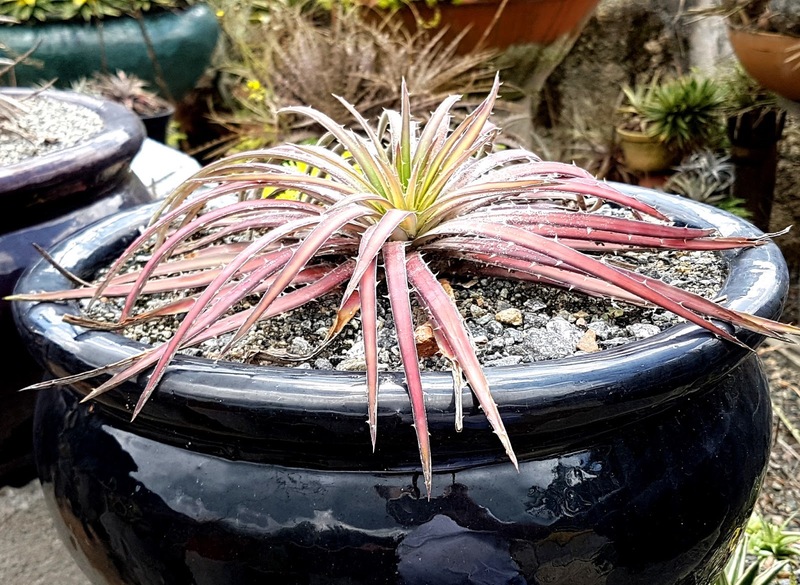 Enameled pot are very expensive here but this rarity deserves that. Dyckia fosteriana/fosteriana cv Star of Brazil, just spectacular! 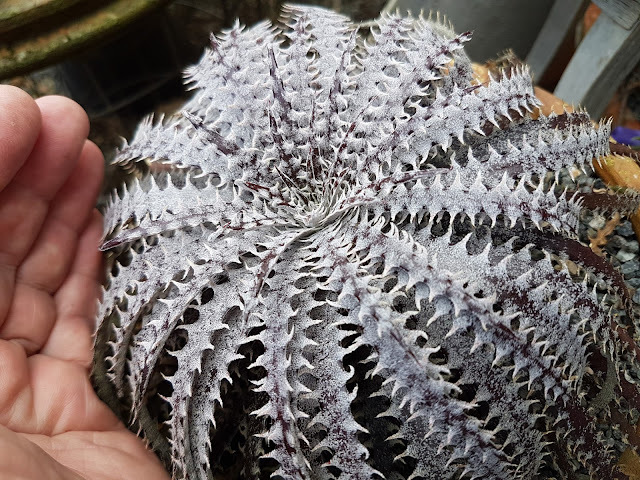 Dyckia hb Milk Way, today. This is a beauty no doubt. 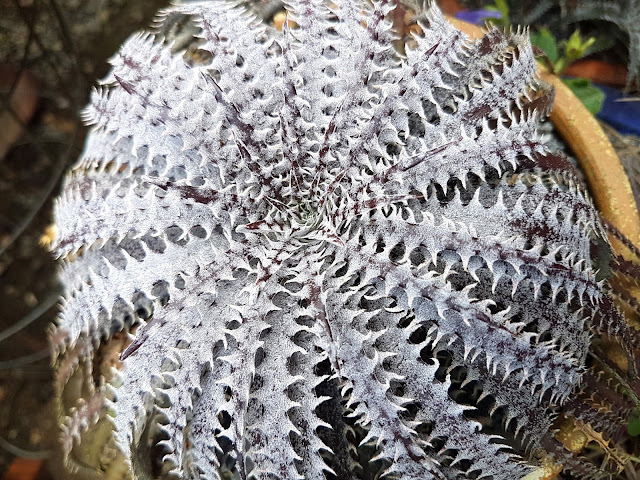 Yes, fanned one and ye, a super white one! This plant was badly kept and shows many bald areas do to heavy rain exposition. 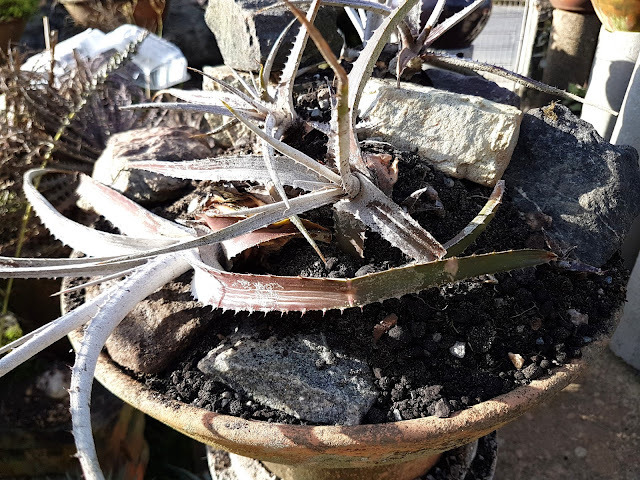 Its scales are so big and loose, rain and strong winds remove them easily. 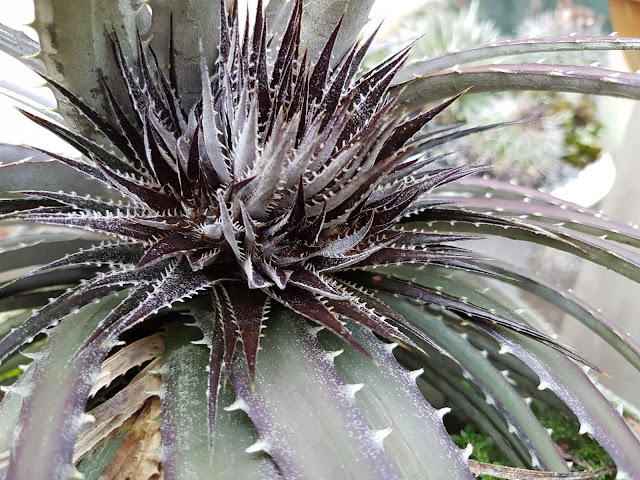 This is a plant to be kept under cover. 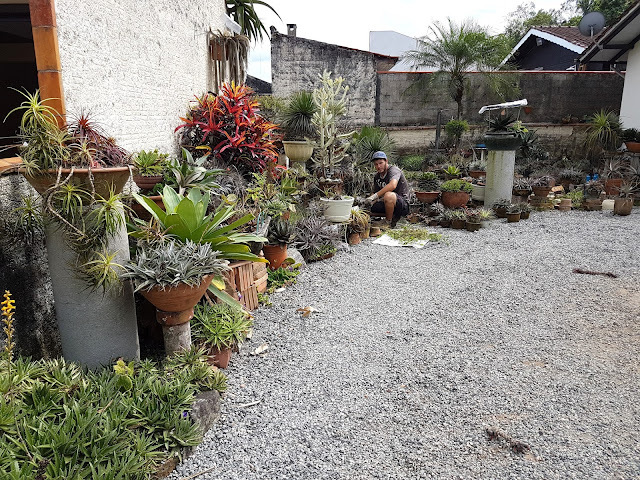 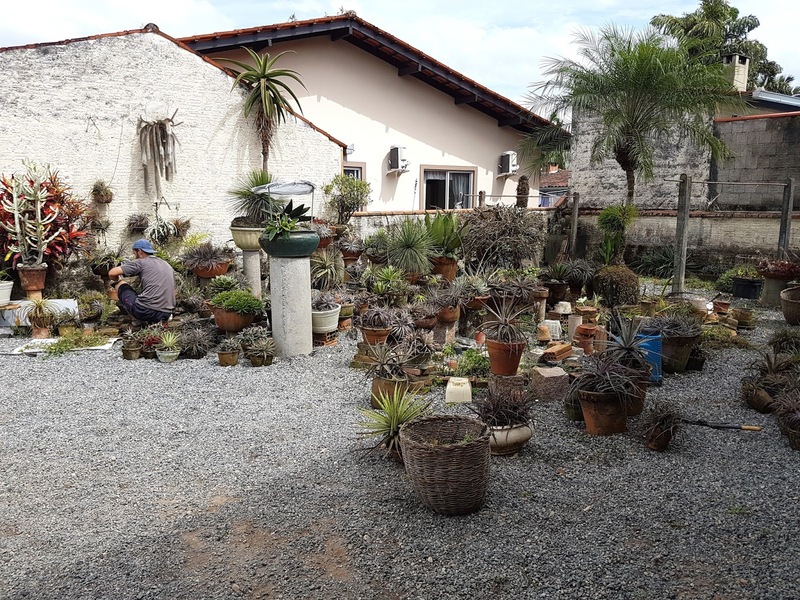 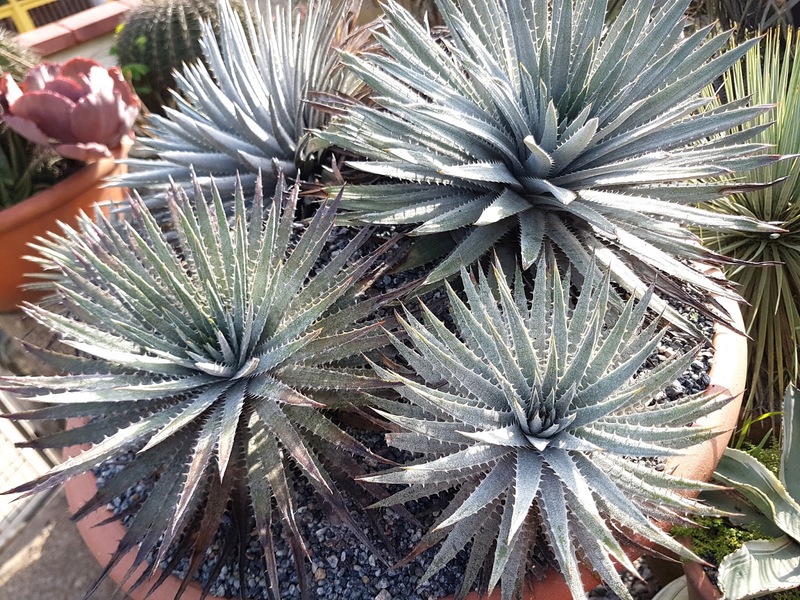 it does resembles Dyckia pottiorum and Dyckia mirandiana but its flowers are quite different from both pottiorum and mirandiana. As one can see it is a rubra form one. Its basal sprouts turn to fan shape as they grow. Here above and bellow one can notice its rich scale dusting. 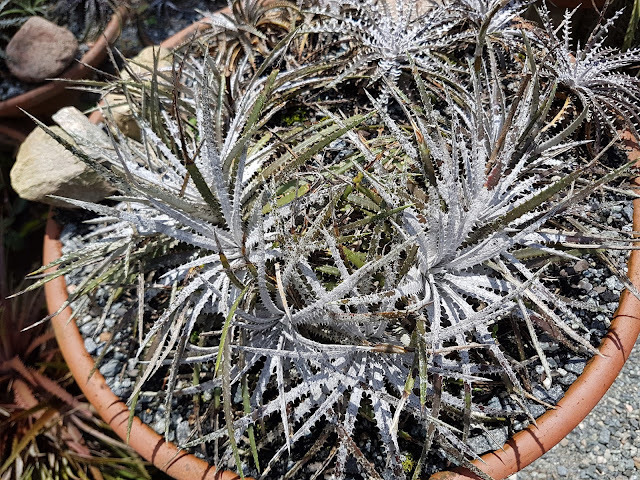 A friend of mine in Japan told it looks like sugar dusting and in fact it does look. 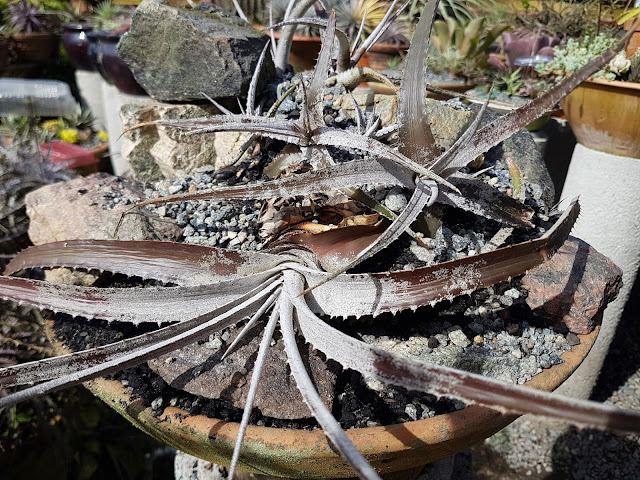 Here the plant is repotted being transferred to a shallow dish like pottery. 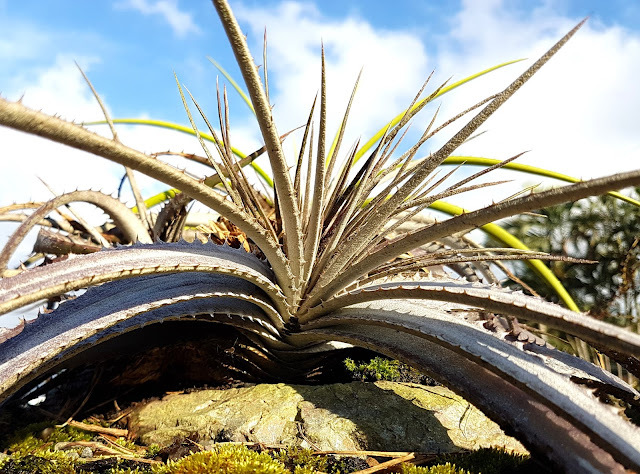 I tried to recreate the Central Brazil Cerrado landscape to please the plant and my eyes. 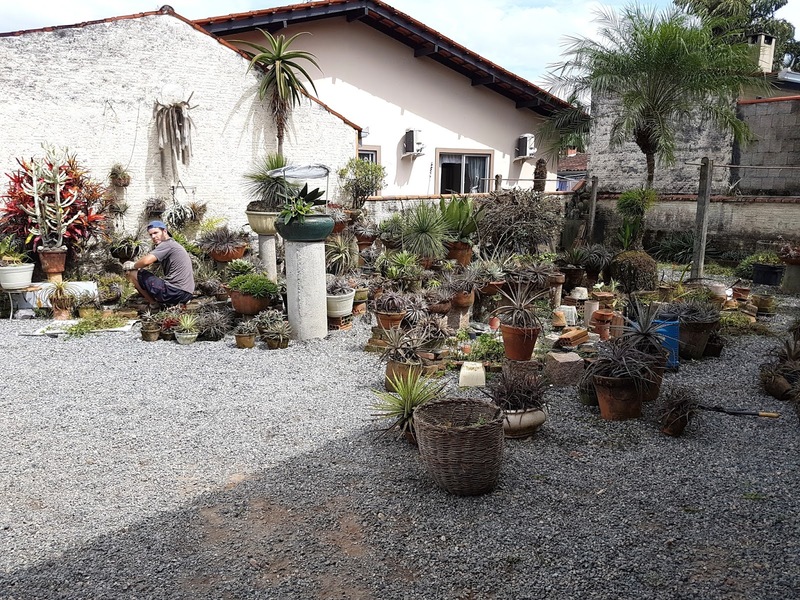 The researcher (Bahia State University) who gave it to me said it is found this way. Here it is kept under special care and observed closely. 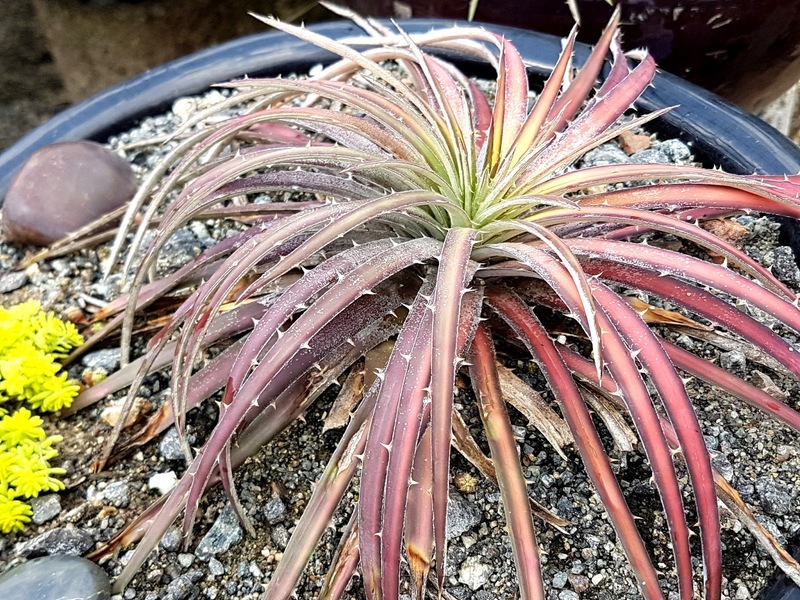 Now I must provide a protection from the rain. 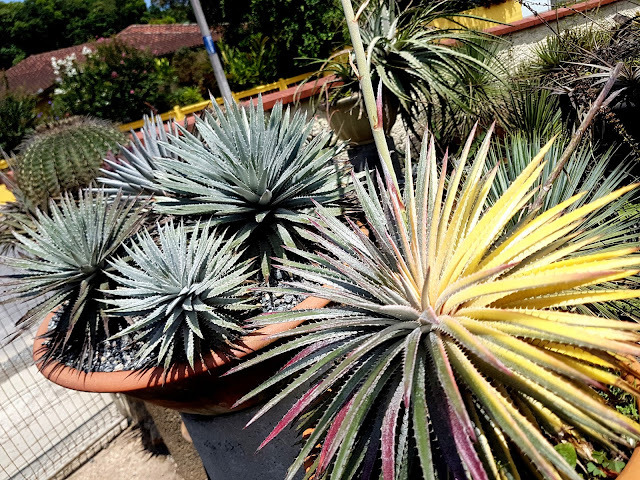 I do believe this is bond to be spectacular. 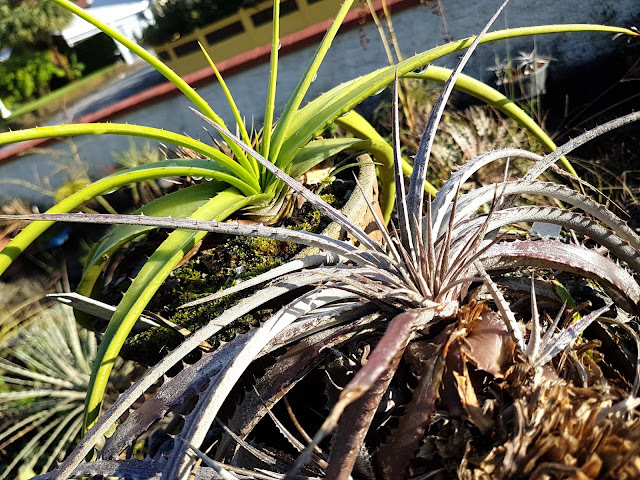 From up above we can see the sprouts begin to get fan shaped. 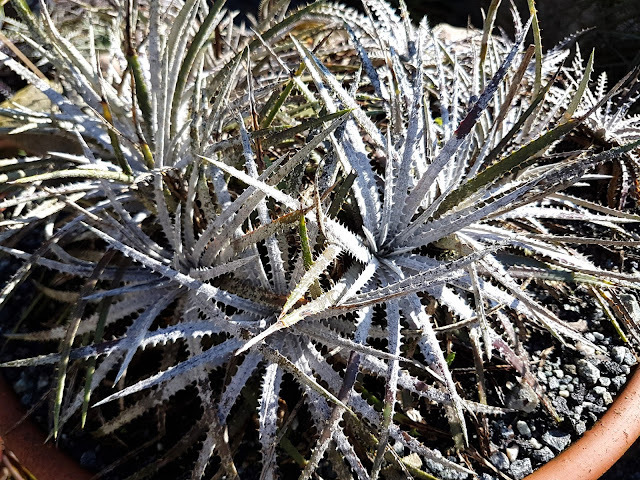 Dyckia hebdingii can be super white too. 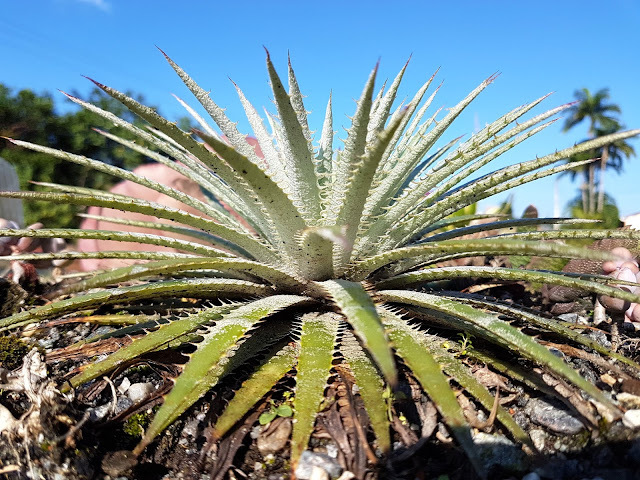 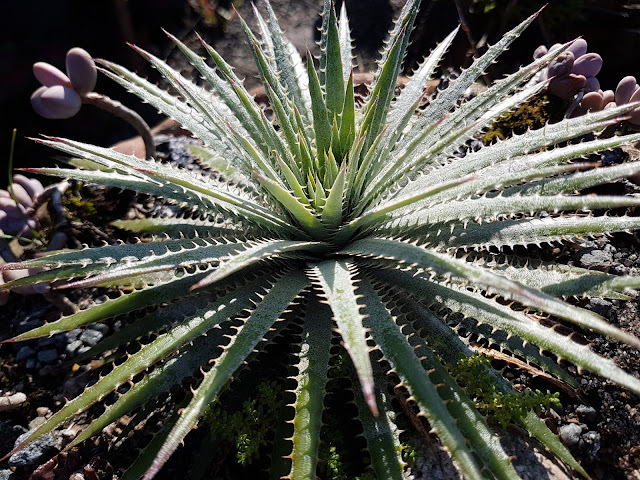 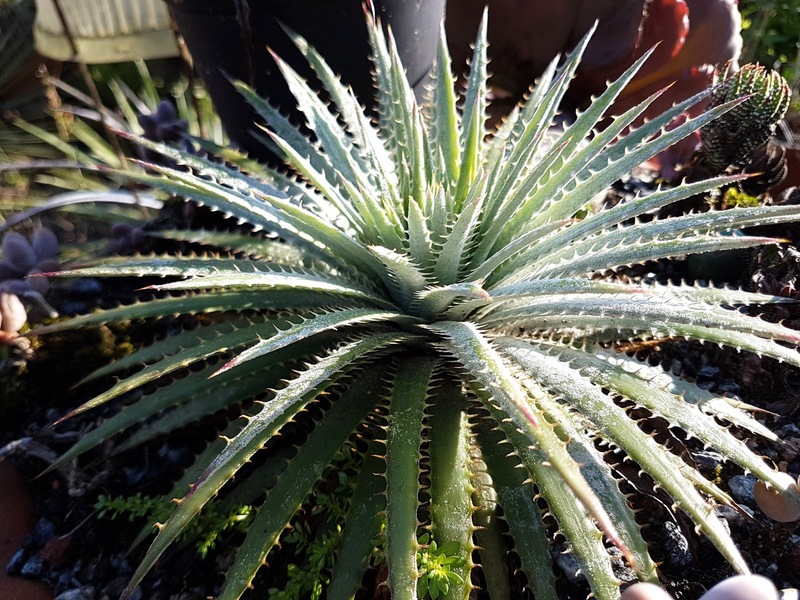 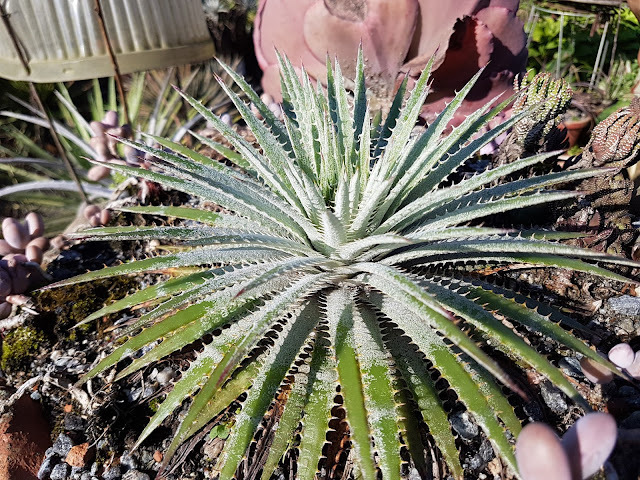 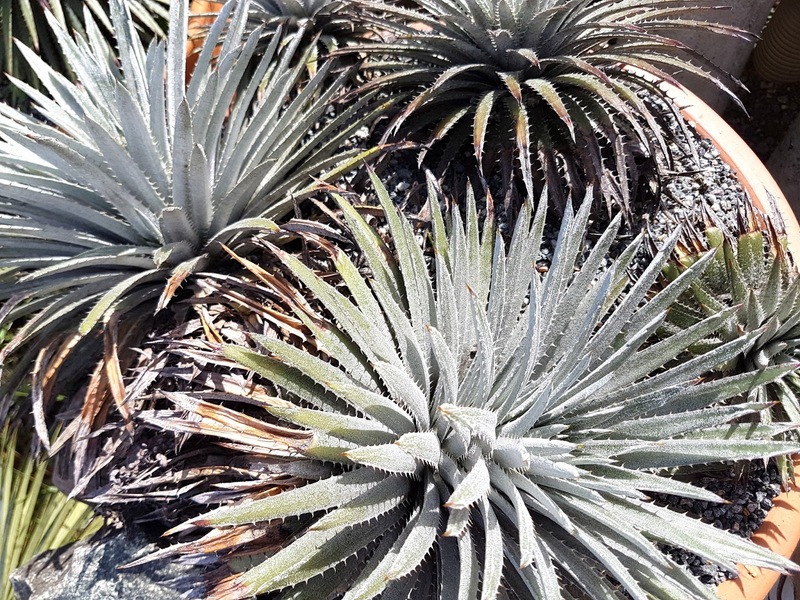 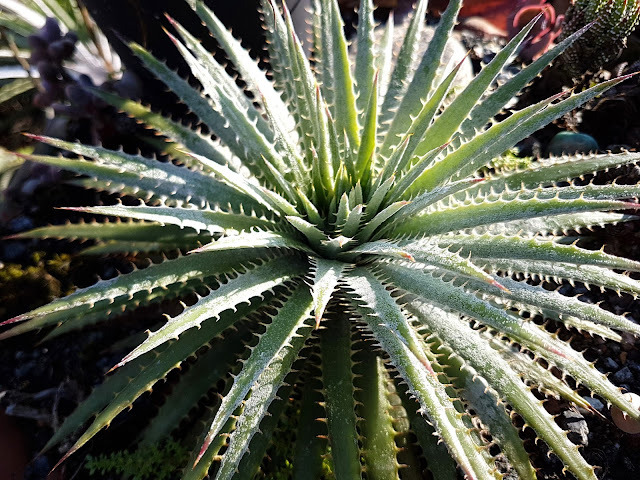 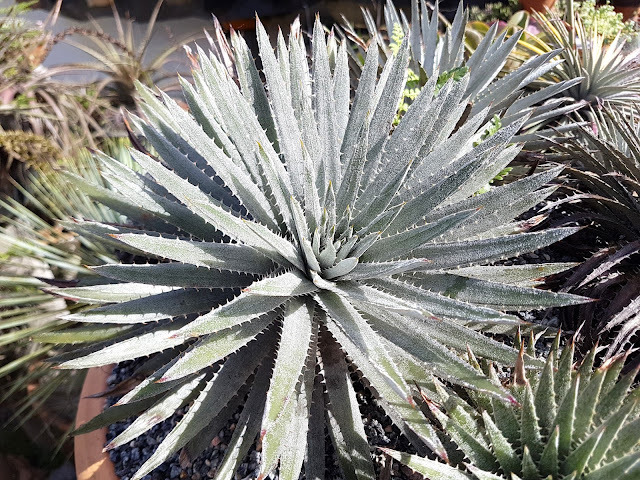 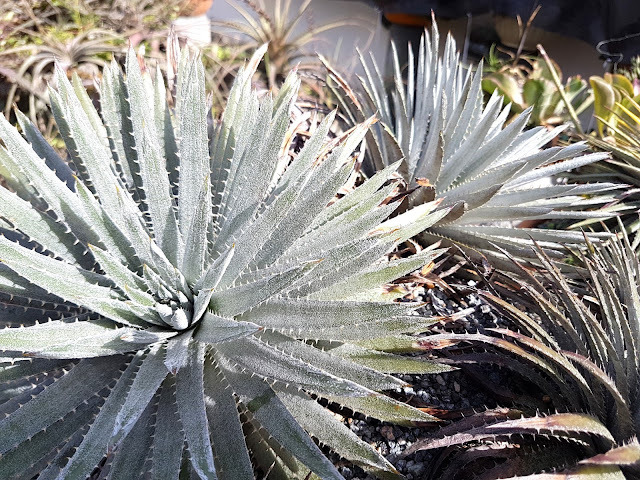 Dyckia monticola var. 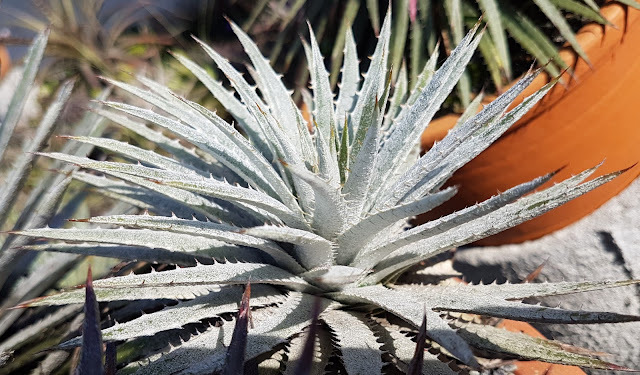 Aurora, a charming rarity. 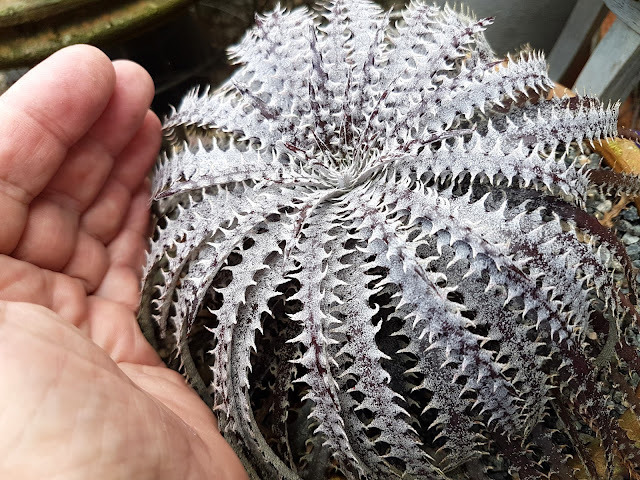 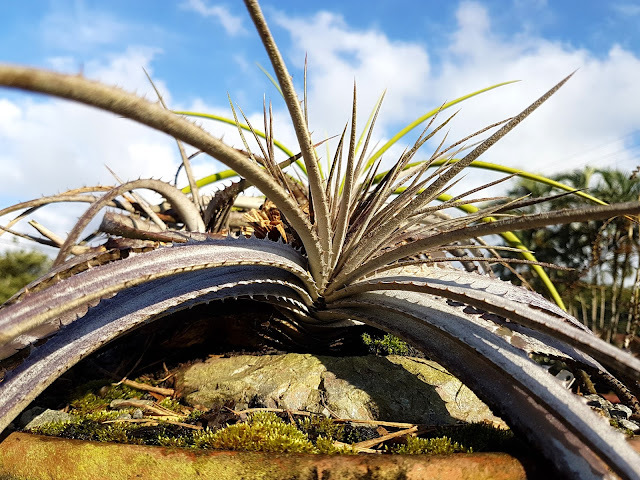 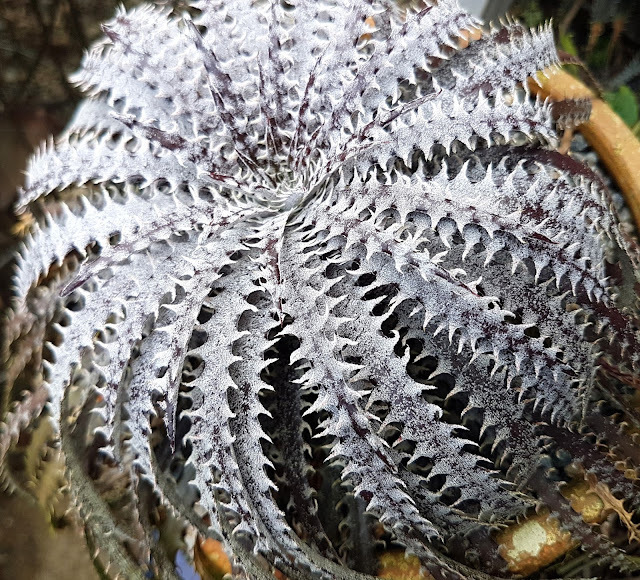 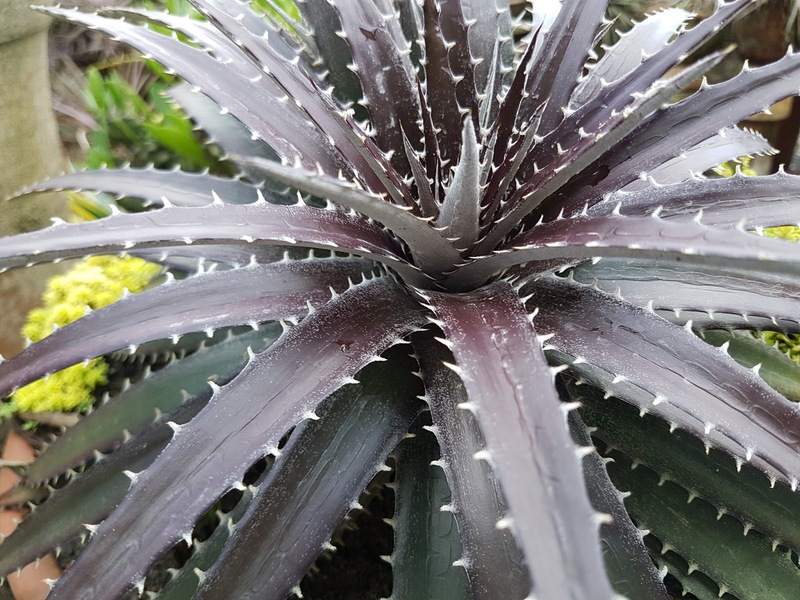 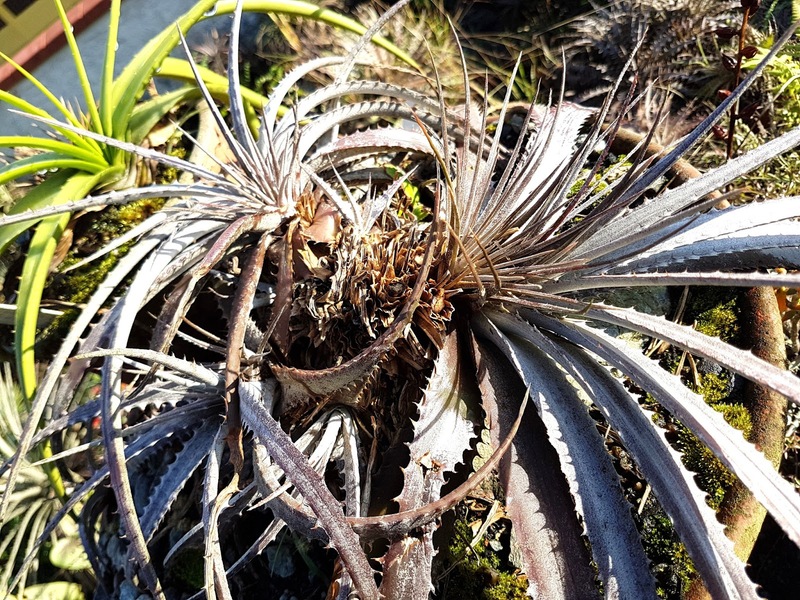 Dyckia pottiorum, the spectacular fanned one. Aurora... 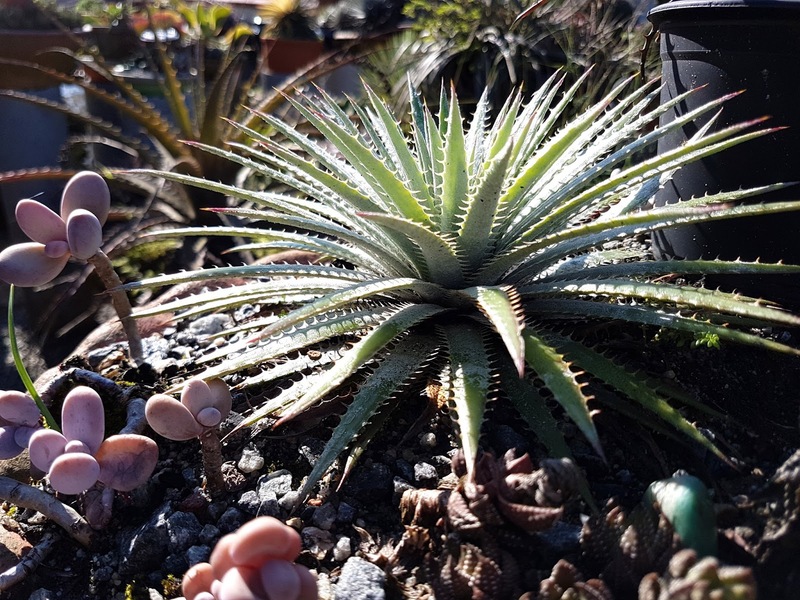 I do ove it! 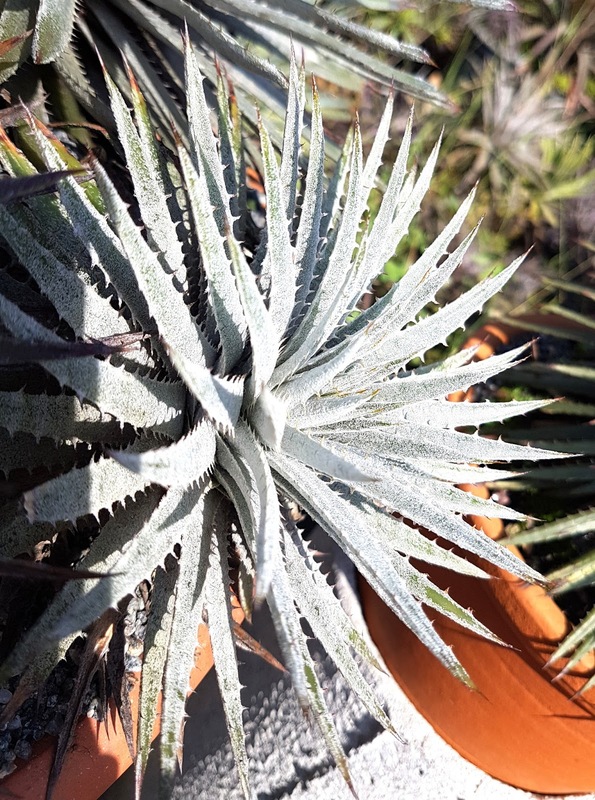 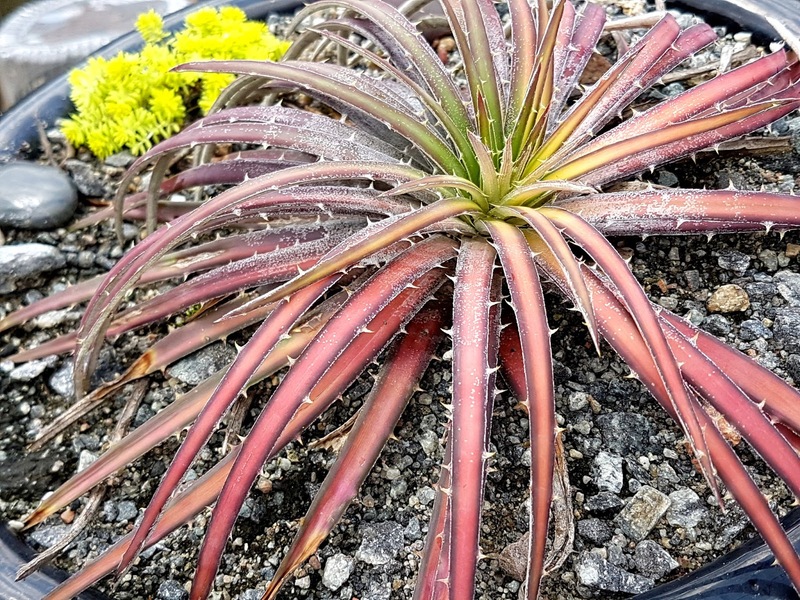 ...a crested and variegated Dyckia reitzii? Dyckia arco-íris first seeds ever.